This is a simple and delicious vegetable beef soup that is ready in under a half of an hour. It’s a delicious and hearty soup that’s great on its own or as an accompaniment to a sandwich or a salad. 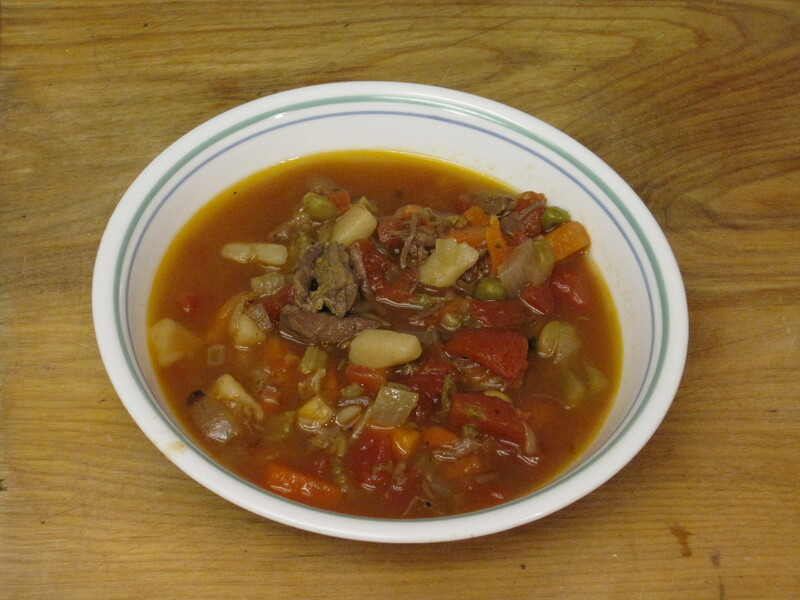 This recipe for vegetable beef soup is so simple to make, it’s possible to have a home made soup on the table for dinner on a busy weeknight. Because the flavor improves over time, this soup can be quickly prepared on the weekend and stored in lunch sized portions to take to work or school. It’s simple, delicious, filling, and figure friendly. This recipe was inspired by my mother’s hamburger soup which was always one of my favorites, but instead of following her recipe, I substituted almost all of the ingredients in her recipe for canned food items. Fortunately, my mother’s recipe was easily adapted, so this version, while different, was perfect. It was exactly what I needed for my 30 days of cans challenge. 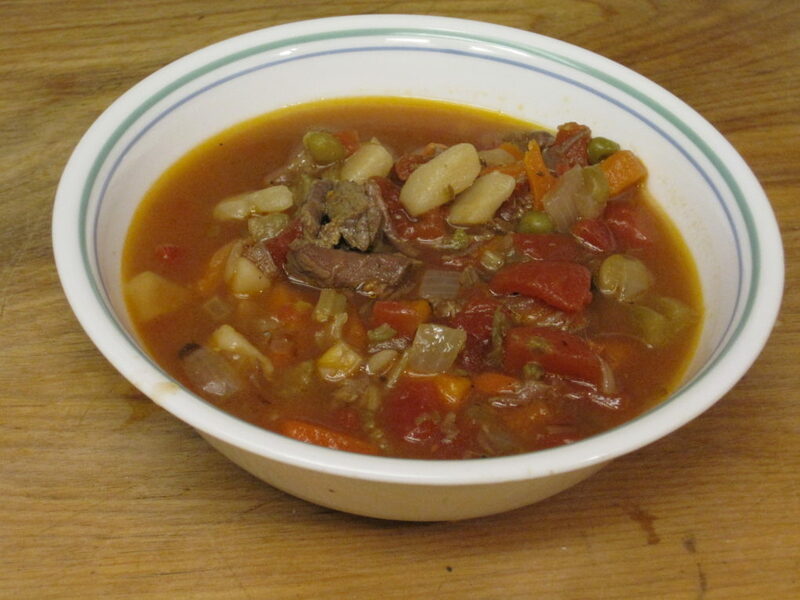 Give our recipe for Vegetable Beef Soup a try and let us know what you think by leaving a comment below. 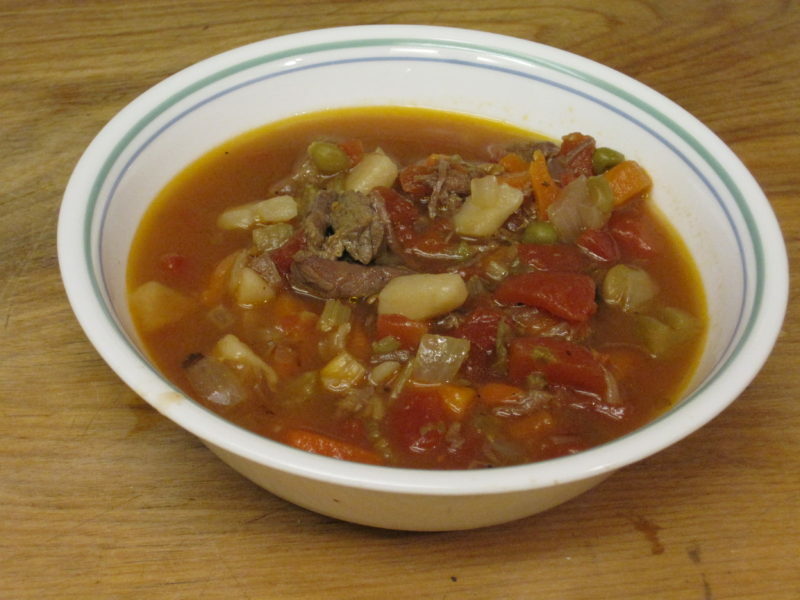 A very simple soup recipe made from canned roast beef and veggies is simple and delicious. Cook's Note: If you don't have dehydrated celery, chop up one celery stalk and add it to the pot with the onion in the beginning then proceed with the recipe as written. If you want to add more flavor, a bit of basil, oregano, or your favorite spices can be added to the soup. We thing that this soup tastes even better on the second day. Total Cost of Recipe: $7.17 or $0.90 per serving. Add chopped onion, and saute until it becomes translucent. Add canned roast beef and the liquid to the pan. Add the cans of mixed vegetables and diced tomatoes and stir to combine. Add 4 cups water and the black pepper. Heat over medium heat until soup comes to a boil. Reduce heat and simmer for 15 minutes to allow flavors to become fully combined. I love a good vegetable soup and if you add beef, extra yum. This soup looks delicious! I love that this one is so versatile. By just changing, or adding, different spices,the final product can be different each time you make it. What a budget friendly soup! Everyone should know how to make this! Delicious! These types of soups are so simple that anyone can make them. That’s part of their charm. The inexpensive ingredients are just an added bonus. I love a good savory soup and this one looks fantastic! My favorite part of this is that it’s so easy to make. Especially after a long day at work.